Fantasy can be an entryway into serious geographical and historical thought. While preparing several GeoCurrents posts, I have come across deeply informed discussions of obscure historical topics in game-players’ discussion boards. 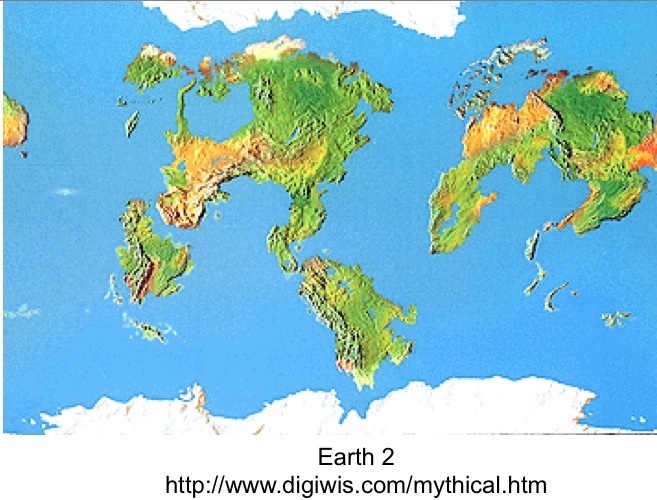 Map-making is also taken seriously by authors and fans of science fiction and fantasy literature. Those who base their stories or games on alternative worlds are especially drawn to cartographic depiction and historical timelines. Such efforts sometimes go well beyond the mere limning of lands and waters, showing such deeper structures as tectonic plates. Whether such remedial education is adequate to the task is another matter. To truly construct a realistic Earth-like world requires the kind of knowledge provided by a college-level course in physical geography; not a few enthusiasts have created handsome worlds that embody glaring geographical contradictions. Consider, for example, the maps posted here. 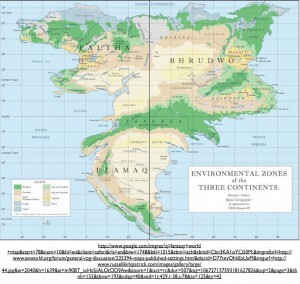 In Earth 2, the brown areas, presumably deserts or semi-deserts, are mostly situated in such necessarily humid areas as the equatorial zone, the upper-mid latitudes on the west side of the largest continent, and the subtropics on the east side of the same landmass. 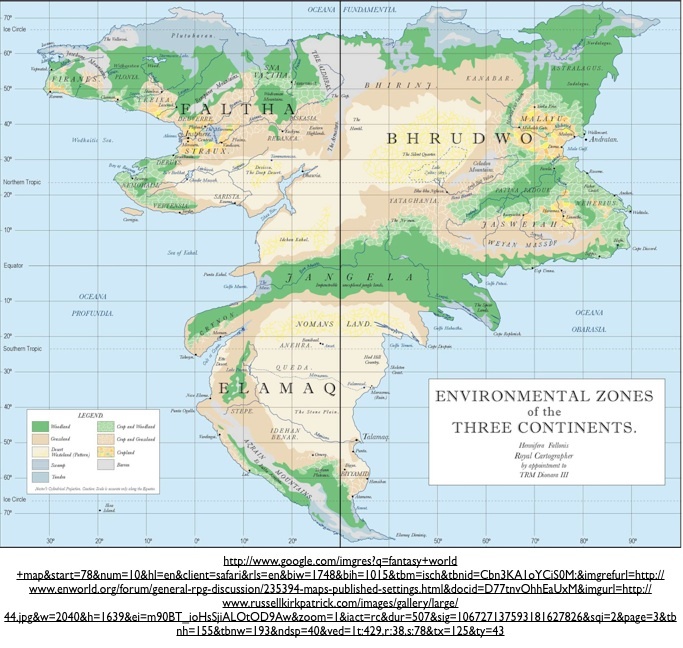 The second map (“Environmental Zones of the Three Continents”), depicting a different imaginary world, does a better job. Note, however, the equatorial desert in the west, as well as the woodlands to its north at around twenty degrees, an area that ought to be desert. * For such patterns to exist, the basic parameters of physics would have to be changed, putting us not merely in an alternative world but in an alternative universe. Such quibbles may seem pedantic—they certainly do to my own children. Perhaps it would be better to stress how far the genre has advanced over the past several decades. In earlier years, most Earth-like planets in science fiction were not just geographically incorrect, but positively simpleminded. Human- (or humanoid-) inhabited globes were routinely imagined not as richly variegated worlds but as simple, uniform places. These kinds of planets represent not alter-worlds so much as samples of our own terrestrial sphere, the geographical equivalents of one-dimensional human characters embodying particular traits. Such failings have been strikingly pronounced in the two largest science fiction franchises, Star Trek and Star Wars. Both series are richly imaginative and consistently thought-provoking, and I have enjoyed them for decades. In terms of basic geography, however, Star Trek and Star Wars leave much to be desired. 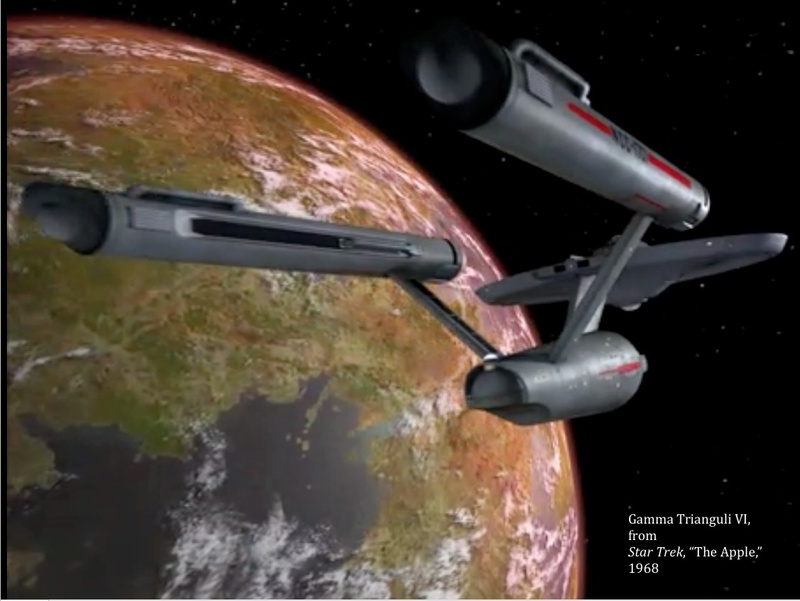 In the original Star Trek television series, which aired from 1966 to 1969, entire planets were portrayed as individual neighborhoods. In almost every episode, the show’s protagonists could stroll to all significant places on a given world once they had beamed down from their spaceship. Such a narrow scope, admittedly, was all but dictated by the series’ restricted budget and special-effects limitations. Yet the much more lavishly produced second Star Trek series, The Next Generation, was little different. Indeed, its world-building capabilities sometimes seem to have declined. 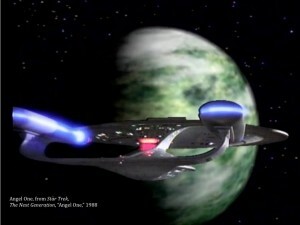 Compare, for example, the planet Gamma Trianguli VI from “The Apple” (1968) with the world that lent its name to the episode entitled “Angel One” (1988). Although the view of Gamma Trianguli VI from the deck of the starship Enterprise gets the cloud patterns wrong (no mid-latitude spiral bands, no thunderheads of an inter-tropical convergence zone), the planet’s topography looks reasonably Earth-like. Angel One, on the other hand, appears more like Neptune: one glance tells you that this is not a place where a mammal from Earth would be able to breathe. Yet when the crew beams down, they encounter nothing alien whatsoever—other than the fact that the women of Angel One physically dominate the men. In the Star Wars franchise, planets tend to be far more fully realized. Rather then being reducible to intimate locales that can be effectively covered on foot, they form expansive spaces that demand mechanized transport. Yet few are depicted as having Earth-like complexity and variation. Instead, they tend to form single environments: if some are completely desertic, others are wholly forested. The films also feature grassland planets, swamp planets, ocean planets, and even a completely urbanized planet packed with a trillion inhabitants. Some worlds are described as entirely temperate, others (impossibly) as completely tropical. ** Most of the planets of Star Wars, in other words, are not worlds at all, but rather expanded stand-ins for particular ecotypes on Earth. Some of the environmentally restricted Star Wars planets are more realistically imagined than others. An ice-covered, perennially frozen sphere, for example, remains within the realm of plausibility. In our universe, such a planet would not be capable of supporting macroscopic life of the kind found on Earth. 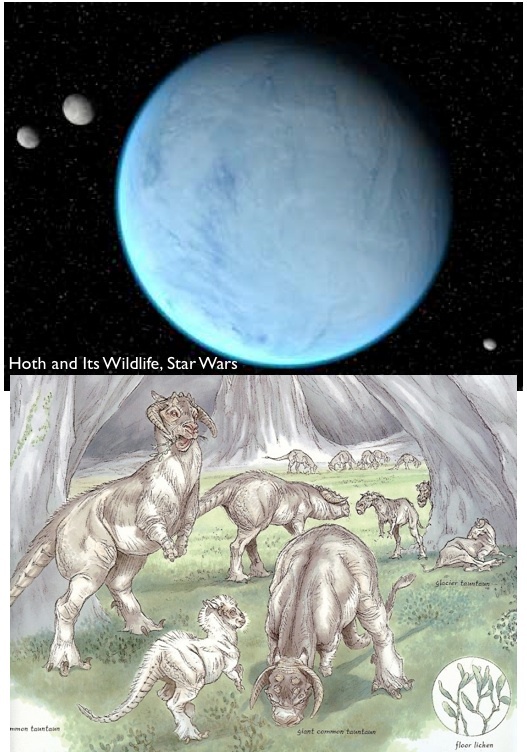 In the Star Wars galaxy, however, Hoth is fully ice-bound, yet supports massive mammalian species. What could such large herbivores as tauntauns possibly eat? Such niceties were ignored in the original film, but Star Wars “Expanded Universe” sources attempt to provide answers. Hoth, we are told, is replete with “under-ice caves containing large lichen fields … on which Tauntauns feed.” Interesting idea, but physically impossible; ice is not stable enough to support long-lasting, light-filled caves of the size necessary to support such ecosystems. Some authors of SciFi and fantasy have elaborated complex geographical patterns, creating what seem to be fully realized alter-worlds. 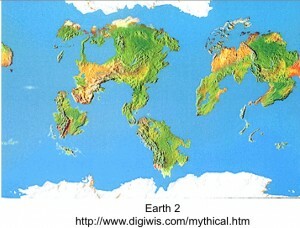 But complexity does not guarantee geographical accuracy, as we shall see in the next GeoCurrents post. *On Earth, deserts are found on the west sides of continents between around 18 and 30 degrees of latitude, and in continental interiors, especially where mountains block prevailing winds. (Note that Afro-Eurasia forms a single continent in this regard.) The exceptions that do exist are generally explainable by oceanic currents, which in turn can be deduced from the basic patterns of land and sea. ** “The tropics” is by definition a restricted latitudinal belt: the zone where the sun is directly overhead at noon once a year (twice at the Equator). A planet whose axis is tiled 90 degrees relative to its orbit around its sun would in this sense be entirely “tropical,” as all areas would experience a mid-day sun angle of 90 degrees. But it would by no means possess a uniformly “tropical” climate, as most areas would experience prolonged periods of the year with little or no sunlight. Even at the equator of such a planet, the sun would not rise above the horizon on the two solstices.